A year ago, West Africa was in crisis mode. The death toll from the Ebola virus had exceeded 800. Cases of the virus were multiplying daily. The international news media was following Ebola extensively, and for good reason: Ebola has up to a 90% mortality rate, and there was no way to stop its progress. Now, a year later, a vaccine has arrived. When tested on the ground in West Africa, the vaccine performed extremely well. The trial was rushed and not as carefully executed as one might like. Nevertheless, this is spectacular news, and it suggests that injecting rVSV-ZEBOV into people who are around Ebola patients can create a buffer zone that will stop the disease from spreading. The new vaccine has momentous potential impacts, but it is by no means a miraculous invention. It relies on principles that have governed vaccines for decades. Like most other vaccines, the Ebola vaccine is designed to spur the body into virus-fighting action before Ebola actually arrives. The goal is to shatter the immune system’s complacency and to make it generate throngs of antibodies. If Ebola does arrive at some later point, the body will not be caught off guard. Tricking the body into producing antibodies for Ebola – without actually giving a patient the live virus – is easier said than done. Each human produces about 10 billion different antibodies. To get the immune system to produce the correct antibodies, the vaccine must contain a virus that, to the body, is identical to Ebola. 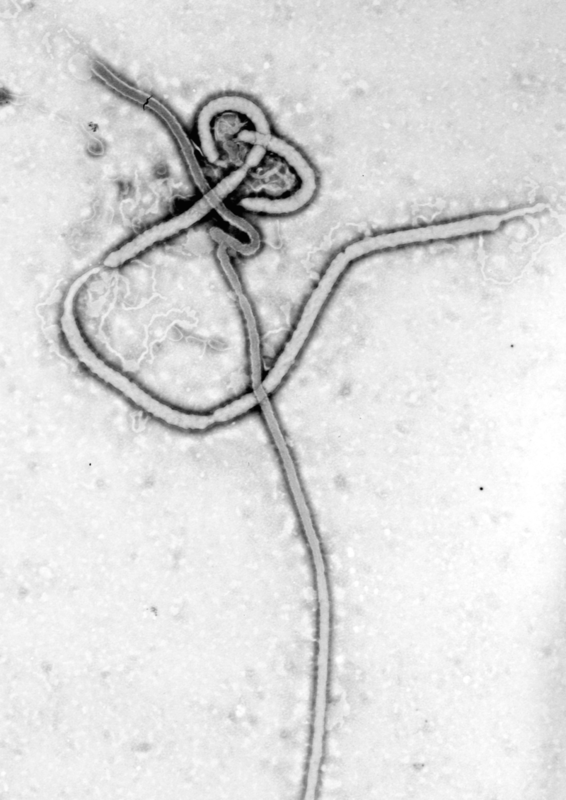 The Ebola virus is long and narrow, like a piece of yarn. It’s made of just six structural proteins, which surround a very small RNA genome. The body can’t identify Ebola by any of its internal components. It relies on giveaways on the surface of the virus itself. The outer membrane of an Ebola particle is embedded with molecules called glycoproteins. The glycoproteins are like signposts embedded all along the threads of Ebola, identifying the virus for what it is. As soon as the body reads the signs, antibody production goes into full force. But the body’s antibody production system isn’t fast enough to keep up with the spread of Ebola. About eighteen hours after Ebola attacks, thousands of new Ebola viruses burst from each infected cell. They pour into the blood stream and speed through the body. Soon, tissues rupture, and the patient is dying. To stop this mad dash of death from ravaging the body, the immune system must be primed in advanced, prepared with an army of antibodies to immediately neutralize Ebola particles. To the body, the virus used in the Ebola vaccine looks just like Ebola. But the vaccine actually contains rVSV, a virus that infects cattle, horses, deer, and pigs, but causes few problems in humans. In the lab, scientists remove the glycoproteins that naturally coat VSV’s surface. They substitute instead Ebola’s glycoproteins. Dressed up as Ebola, but in reality completely harmless, rVSV-ZEBOV is injected into the body. It somehow seems hard to believe that this relatively simple deception could work. But in vaccines from polio to influenza, similar methods have virtually liberated the world from the scourge of these viruses. Tricking the body into thinking something is present that isn’t is a tried and true method. The question for the Ebola vaccine is whether it works 100% of the time, whether there is a pragmatic way to produce, transport, and administer it, and whether there are any major side effects. With any luck, the vaccine will be mass-produced, and Ebola will soon be a thing of the past.